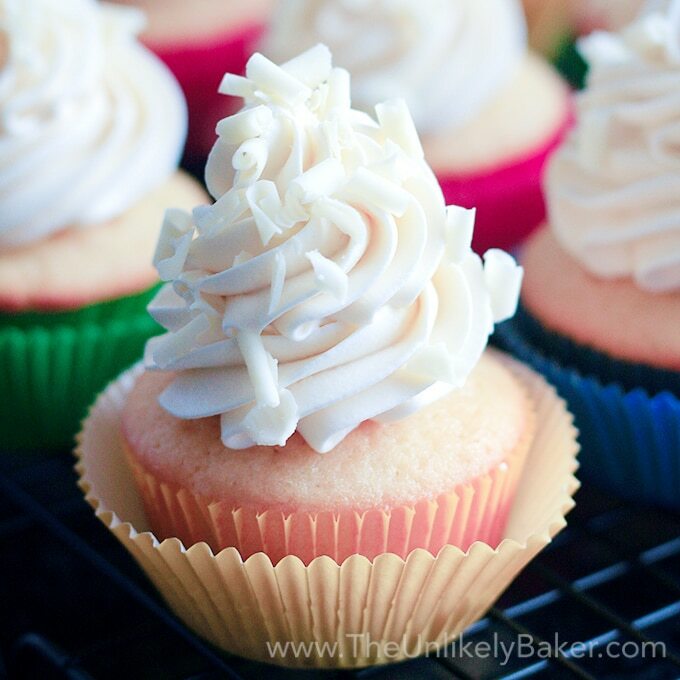 Soft, fluffy chiffon cupcakes filled with delicate whipped cream. 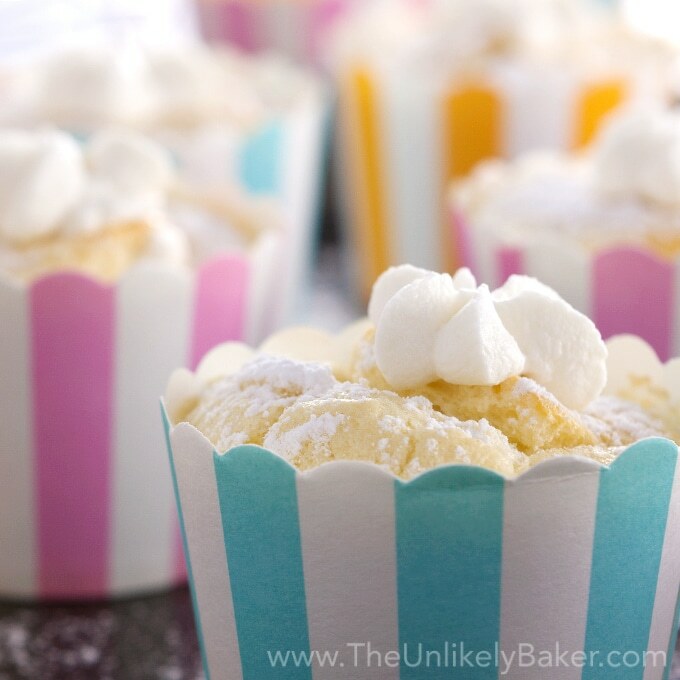 Hokkaido chiffon cupcakes are light as air and so delicious! I must admit – in addition to Filipino desserts, I’m also a little obsessed with Japanese desserts (check out my take on Japanese Cheesecake and Baked Lava Cheese Tarts – both of which are Japanese-inspired). They are always so delicate and not overly sweet. They don’t need a whole lot of frosting (if any), don’t involve complicated flavours and are just so good! Just like these Hokkaido chiffon cupcakes. When someone says cupcakes I think cake + a boatload of frosting. But these Hokkaido chiffon cupcakes are anything but. I’ve never been to Hokkaido and I haven’t actually tasted Hokkaido cupcakes before I started making these but if these cupcakes are any indication, then Hokkaido must be my spirit homeland. The cupcakes are light, not overly sweet and just a joy to eat. And they only get better the longer you refrigerate them (the last batch I baked tasted that much better the next day – and yes it’s a mystery why they lasted that long without getting devoured. Maybe someone hid them at the back of the fridge so no one can see them?). More whipped cream? Yes please! I found the recipe here though I’ve had to make changes – for one, the whipped cream wasn’t nearly enough for someone as heavy-handed as me (and trust me, more is better!). So I adjusted the recipe to make more. And if you want to make them festive, just get some holiday-themed cups and you’re done! Between the whipped cream and the confectioner’s sugar, these cupcakes are just waiting to be served (then admired then gobbled up). Though there’s nothing wrong with making them just for you, for today. And in fact I’ve done that a few times. They are great with coffee in the morning (yes, cupcakes for breakfast! ), tea in the afternoon or, you know, the occasional midnight snack. As I bake more I learn that weighing ingredients instead of measuring them using cups and spoons results to more wins and less tears. So little by little I’m adding both weight and volume measurements to my recipes. , it’s inexpensive and so useful! These cupcakes are different and so unlike the cupcakes we’re used to and that’s why you guys need to try them (here’s another unique cupcake for you: Brazo de Mercedes Cupcakes)! You will not be disappointed. They are amazing. Preheat oven to 325F. Grab the bowl and whisk you're going to use to whip your cream and chill them in the fridge. Using a handheld electric mixer or a stand mixer fitted with the whisk attachment, whisk 3 egg yolks and 20 grams sugar until significantly lighter in colour (about 8 minutes on med-high speed). Add 35 ml canola oil and 60 ml milk and continue whisking until thoroughly incorporated. Switch to low speed and add 70 grams cake flour. Whisk until just combined. Set aside. In a separate bowl using a different whisk, beat 3 egg whites until foamy. Gradually add 25 grams sugar until you reach stiff peaks. Fold your egg whites into your egg yolks until just combined. Be careful not to overdo it so as not to deflate your egg whites. Transfer your batter into cupcake cups (see notes) until they are 3/4 full and place on baking sheet. Bake for 20 minutes or until the tops start to turn light brown and crack. Set on a wire rack to cool completely (see notes). Get your chilled bowl and whisk from the fridge and whisk all your ingredients until you reach stiff peaks. 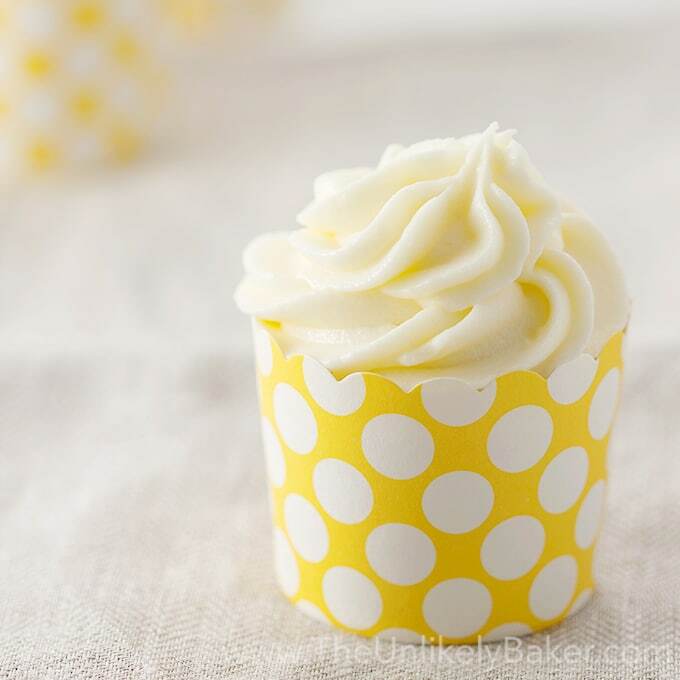 Ensure your cupcakes have cooled down completely before filling them with whipped cream. Transfer your cream into a piping bag fitted with your preferred tip. Insert tip in the middle of cupcake and gently press to fill the cakes (you will feel the cakes getting puffy). Stop the minute you start to see the filling show on top. Dust with confectioner's sugar. 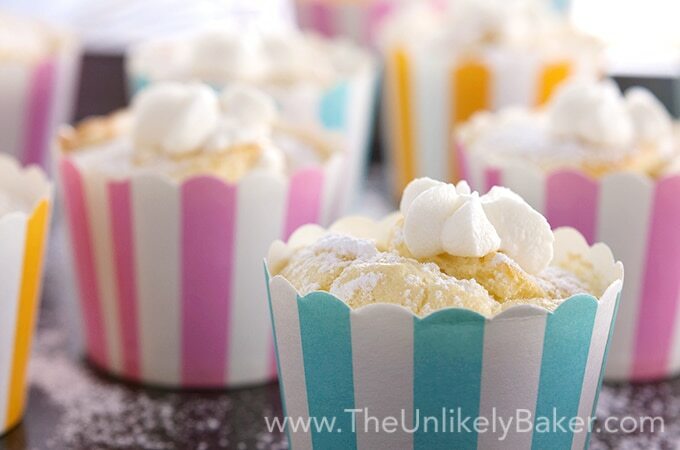 For best results, use cardboard cupcake cups (the ones that don't need to be put inside a cupcake pan to hold their shape). The cupcakes are going to be super fluffy freshly baked then will deflate slightly as they cool down. This is normal. This recipe yields 9-13 cupcakes depending on the size of cupcake cups you use. (Recipe adapted from Nasi Lemak Lover). Did you make Hokkaido chiffon cupcakes? I’d love to hear from you in the comments section below. Looking for more traditional cupcakes? Here you go! Hi, I made these today and they’re great. They fell quite a bit as they cooled puff back up with all the cream going in. Would be great for special afternoon tea. I got the link to this page from a friend and I just had to make them NOW. Thanks for the recipe. Hi Jan! So glad you liked them! Hope you’re having a lovely weekend. I am planning to follow ur recipe on this for my kid’s birthday party. I was wondering if it’ll be alright to prepare it one day in advance. Hear from you soon! Hi Nurul! We’ve had them kept in the fridge in an airtight container for as long as 2 days and they were still OK. They won’t be as souffle-like (they will deflate) but the cake and the filling were still good. I’d suggest keeping them no longer than overnight if you’re serving them. And note that since the filling is whipped cream, they are best eaten cold. Have fun making and eating them! Happy birthday to your kid! I love all of your cupcakes. Your photography is wonderful. 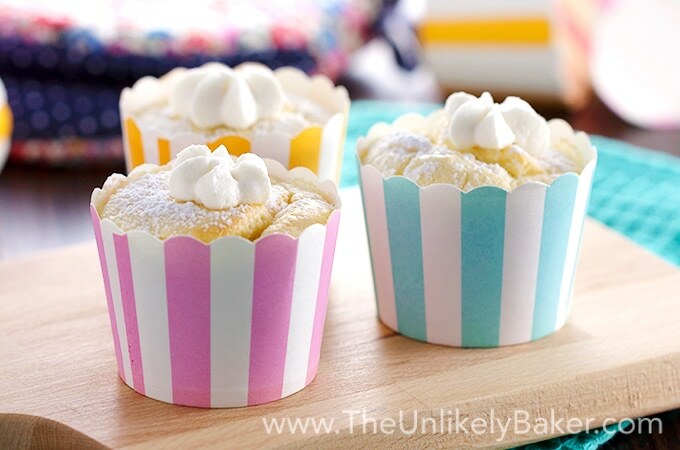 These chiffon cupcakes look lovely and light. These are so pretty, and love that they are filled with whipped cream! These are so cute! I’ve never heard of Hokkaido cupcakes before but would love to give them a try. They look so light, fluffy, and squishy. Your cupcake holders are adorable, too. Where do you find those? if this is the kind of dessert they make in japan i must go immediatley! I love the way these look and I can only imagine how great they taste! I can’t believe how fluffy those look! Almost like angel cake. They are super light! And they are not sweet at all. You’d want to eat more (and more!) so be warned lol. These are so fun and they sound amazing. I am a cupcake fiend and I will definitely be adding this to my “must try” list. Aha! Fellow fiend 🙂 Enjoy! Hi Natanja! They are so light and addicting that we sometimes forget they count as calories too haha! And I love the liners too 🙂 If I remember correctly, I got them on clearance so double yay. These cupcakes look so fluffy and moist. They would be a big hit at any kid’s birthday party. These look So good! I am actually not a huge frosting person; I enjoy the cake part of the cupcake MUCH more so I feel like I would LOVE these! Perfect for spring! I was thinking of making cupcakes so i’ll def be going through your blog! Awesome! I’m excited for you 🙂 Hope you find something you like! Would love to hear back how it goes. These look so light and fluffy! I’m not usually crazy for a ton of frosting but this actually looks like the perfect ratio. Yum! These are so festive and pretty– perfect for spring. I bet they taste amazing too! I got to visit Japan not too long ago and I was blown away by the desserts. There was a pastry and sweet shop on every block it seemed! These look delightful – I can’t wait to try them! These cupcakes are gorgeous! I’ve had Hokkaido sweet bread before and loved it so I’m sure these cupcakes will be lovely too! These are totally great for Easter! They look so delicious! Absolutely! I’d top them with a chocolate egg and you’re all set 🙂 Thanks Latasha! Oh my gosh these look so light and fluffy and amazing! These look so light and absolutely delicious! Oh I;m drooling! This cupcake looks like heaven! My family will love this. 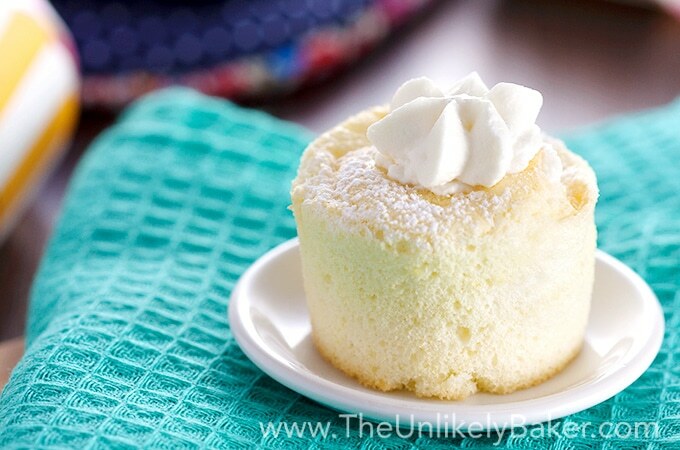 I love chiffon cakes and I will definitely try this cupcake. I am saving this one! Thanks for sharing this recipe! My pleasure Gracie! Hope you guys like them! These were so puffy, I thought they were popcorn at first. 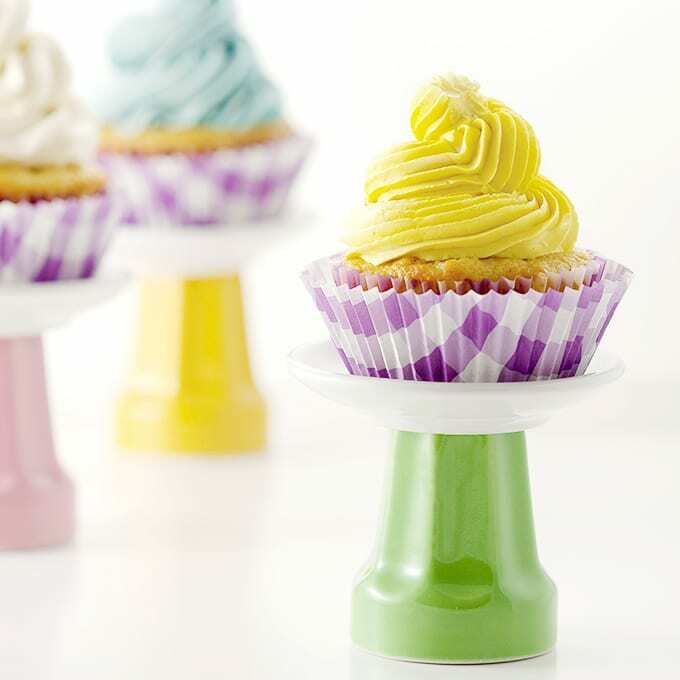 I love those little cupcake holders, adorable, not to mention, yum! LOL did you? Too funny 🙂 Thanks Cindy! Oh these look so good and fluffy! I have never had these before, I love baked goods of any kind and these I want to try! These are quick and easy to do. Hope you get to try them! I’d love this with my afternoon coffee.. the perfect combo! These look heavenly! I love light and fluffy cakes so I bet I would love these. Can’t wait to try this recipe! Wow! Your photos are sooo lovely! I pinned them to my “Food | Cheat Meal| board! Thanks for the post! Aww thanks for the compliment and the pin Crystal! And the board is definitely appropriate lol! I’ve never heard of these before. I tend to lean to Italian cuisine, given my upbringing. They look so light and fluffy! Hi Christine! They’re technically chiffon cakes in mini form 🙂 I must say I’m a little obsessed with Japanese desserts. They’re so delicate and so good! Hope you get to try these…and hope you like them! Not to be a bad influence or anything (hahaha me saying that is a bad sign isn’t it) but perhaps these can be your cheat day treat? 🙂 Thanks Jade! These are picture perfect and look delicious! I always love a good cupcake recipe! I cannot agree more! I love me some halo halo AND Japanese sweets! These look so perfectly light and decadent. Can’t wait to get my bake on. Oh cool! I think trying to make some of these for the first time would be fun. We’ve never made this kind of cupcake. Oh my goodness. I wish I could just reach into the computer screen and grab these! I want to make them soon! The cupcakes almost look too pretty to eat! 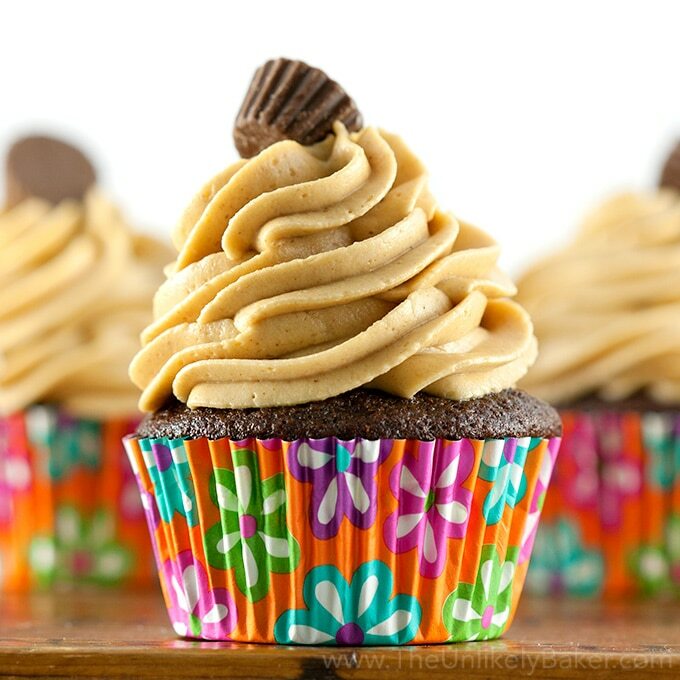 I’m not always a fan of a ton of frosting, so I think these would be perfect. I have never heard of these, but they look amazing. So light and fluffy! Hi Kallee! 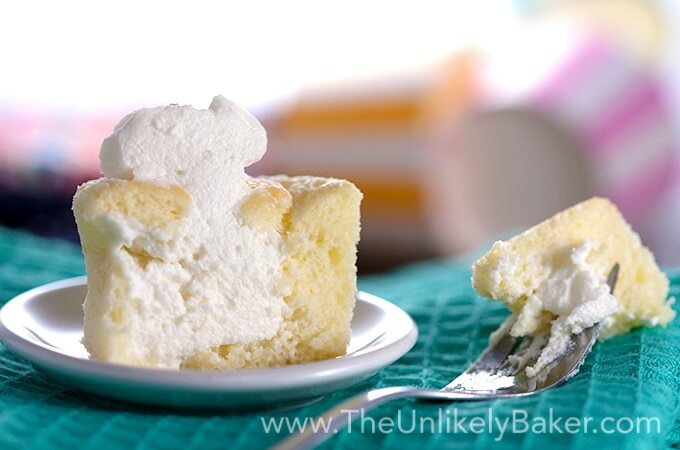 Think of them as super light chiffon cakes in mini form…then piped with whipped cream 🙂 They’re delightful! Hope you get to try them! LOL I could never make something like this and make it look that good too! Great job! I’ll have to try this when I’m definitely more confident in my culinary skills! You’ll be surprised Katriza! These are seriously simpler to make than they look. And everything looks more amazing sprinkled with confectioner’s sugar IMO 🙂 Hope you give it a shot! Never made these before but they do look delicious, airy and light! I think my boys would love them. Oh wow, this looks amazing. And also slightly dangerous because they would taste so light, that I could probably eat quite a few in one sitting. This is such a light cupcake for summer! Love it! Pinning! Your ‘spirit homeland’. Girl, you’re funny! I’ve never had this before, either, but they look awesome! You know what? I’m not a big fan of copious amount of frosting on cupcakes anyway. I find it too sickly sweet. You know sometimes you see cupcakes and there’s probably more frosting than cake? Yeah, not my style (especially knowing all the fat and sugar that’s in there). These, though, look amazing! They look so light and fluffy. I recently picked up a scale for weighing ingredients too and do use it occasionally. Apparently, it is supposed to be much more accurate than using cups. Pinning these cupcakes and making soon. Until then, feel free to send me some of yours 😉 Hehehe! Hi Dawn! Me too. I usually only eat half the frosting which is totally ironic because I’m a heavy froster lol. We’ve had a kitchen scale for a while but I’ve only recently used it regularly this year. Just call it my lazy behind haha. Thanks for the pin! How about an exchange? You send me some of your amazing chili and I send you some of these cupcakes? Though our boxes would prolly both be eaten by someone in transit teehee. Happy almost Friday (almost! ).